Sales of the Making American History Coin & Currency Set hurdled 50,000 by jumping almost 5,000 in seven days — an increase not seen since the first full week after the set’s August 7, 2012 release. New United States Mint sales figures have the sets up 4,974 to 51,868, making them the second best-selling numismatic silver product of the week and the fifth best overall. The latest sales tally is above the set’s initial production run of 50,000, but the U.S. Mint indicated a 100,000 unit potential based on the availability of $5 bills — one of the two collectibles in each set. Below is a breakdown of weekly sales since the release of the Making American History Coin & Currency Set in early August. Holiday shopping in November helped in driving sales higher after weekly amounts had fallen to the sub-500 area in October. A joint U.S. Mint and Bureau of Engraving and Printing product, each Making American History Coin & Currency Set has a coin and note. 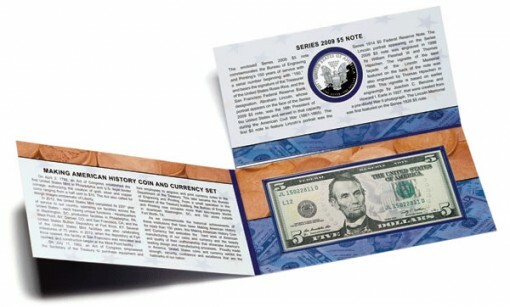 The note is a Series 2009 $5 bill with a beginning serial number of "150" to commemorate the BEP’s 150th anniversary. The coin is a 2012-S Proof American Silver Eagle that is struck in one ounce of 99.9% fine silver. It carries an "S" mint mark to denote its production at the San Francisco Mint. While there is no physical aspect on the coin denoting an anniversary, it is within the set as a reminder of the U.S. Mint’s 220th year of service. Orders for the coin and currency set may be placed online at the U.S. Mint website located here. The set’s price is $72.95. There is no shortage of five dollar bills. They can just print off another series or change thefederal reserve district. It would not surprise me to see the product go over 100k. I didn’t buy any. So it will probably be worth a lot of $$$ in the future. People are finally waking up to the lower mintage. The 2 coin SF set should get a boost in the not too distant future. The three things that determine prices are mintage, mintage and mintage. Demand is created by mintage.